You are currently browsing the Homeschooling adVentures blog archives for September, 2013. 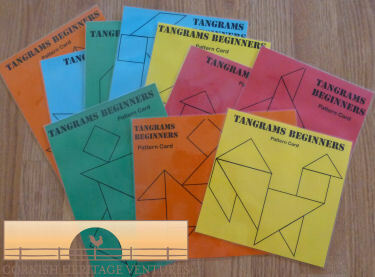 Education.com sent me details on FREE printable Tangrams this week 🙂 A great selection of Tangram Pattern Cards along with 2 different colored sets of Tangram pieces so a couple children can play this at one time. Obviously if you want more than two children playing at a time, print out extra sets. I recommend printing out the Pattern Cards on colored paper & then laminating them & the colored pieces so that they can enjoy a long life without getting cut up, crumpled, drawn on etc. Oh, I know your children are perfect angels but you just don’t want to put temptation in their way! Hee Hee! To store I used a cheap (15c) folder with pockets that I had here. (Be inventive & use whatever you have on hand.) 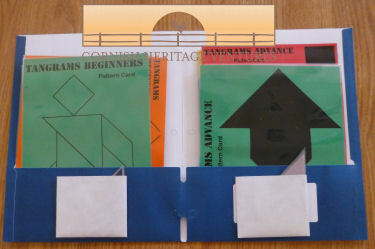 For the two small white pockets I sealed a small envelope, cut it in half, covered each half in clear book covering for reinforcement & used four velor dots on the back of each to secure them to the folder & then put one velcro dot inside the top of the envelope to hold the pieces in. Works like a dream. We have this out where the children can access it & I will be using it to keep Caleb occupied at times when I am trying to teach the older two. 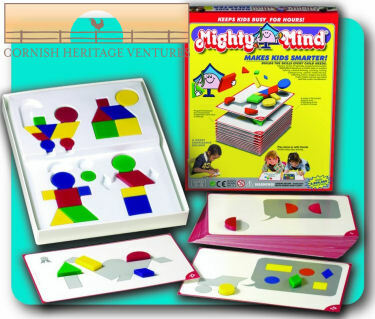 Tangrams are what I consider a precursor to Mighty Mind & Mighty Mind Super Challenger. We have both these sets & they are great for older children. Really gets them thinking about shapes, sizes etc. Highly recommend them.